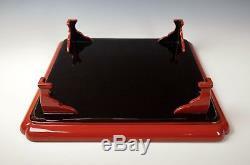 STUNNING ANTIQUE JAPANESE LACQUERED SERVING TRAY / DISPLAY STAND. Magnificent Hand Painted Golden Maki-e, Meiji Period 1800's. 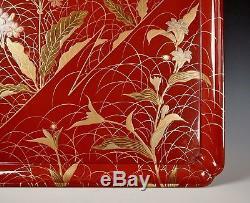 Gorgeous, hand lacquered tray representing the sublime elegance of the Japanese aesthetic. 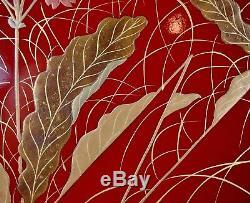 Featuring absolutely stunning hand applied golden makie lacquer detail. Beautifully rendered blossoming branches, individually depicted blades of grass, and gently twisting leaves, all upon a vibrant vermilion red ground. 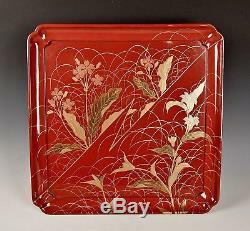 The artisan who created this superb tray was a master craftsman who utilized many techniques including, maki-e (gold sprinkled), takamakie (raised design), kirikane (tiny inlaid gold squares), and red polished urushi which sets off the design in spectacular fashion. Too much to list, see photos for all of the exquisite detail. The elegant Meiji period tray is of sublime form and stands upon four sculptural lacquered wooden legs, with the underside completely covered black urushi lacquer. Traditionally used to serve special holiday sweets, today the tray would be perfect as a display stand, as a serving piece, or simply as a magnificent art piece on its own. In excellent antique condition with very minor wear commensurate with age. Must have been carefully stored by its owners for over a hundred years. An utterly amazing example of the artistry of a bygone era. The stand is a very useful size, measuring approximately 12.75 inches square. 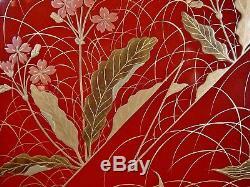 Would make an exquisite desktop, sideboard, or dresser piece. Would have graced the home of a family of wealth and means in the late 1800s. A unique and skillfully crafted work of art, and an outstanding centerpiece for the discriminating collector of Japanese antiques. See all 9 photos above left. 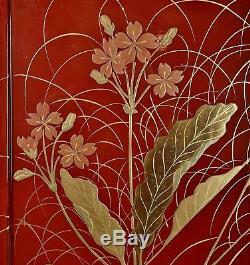 The process of creating such trays from hand lacquered wood required the talents of one or more highly skilled artisans as well as a considerable investment in time. It was necessary to carefully dry the wood for an entire year before being shaped. Several more months of drying may have then been needed before the lacquer finish could be applied to the tray form. The lacquer work would then require time to complete as multiple coats were applied and each coat must dry completely in a carefully controlled atmosphere before proceeding. Still more time was required if the tray was to be decorated by a maki-e lacquer artist who would painstakingly paint the detailed and raised images. An entire piece of fine Japanese lacquer ware such as this one would have taken many months to complete. VIEW OUR OTHER ANTIQUE TREASURES & OFFERINGS HERE. We have many wonderful Asian antiques listed this week including Satsuma, Inro, Netsuke, Bronze, Foo Lions, Kutani, Jade, Coral, Baskets, Lacquer, Pottery, Snuff Bottles, Chado Tea Ceremony items, Tsuba, Menuki, Okimono, Woodblock Prints, Cinnabar Lacquer, Chinese Porcelain, Scrolls, Famille Rose, Ikebana Usubata, Yixing, Cloisonne, Hibachi, Kogo, Incense Censers, Okimono, Thangkas, Sagemono, Lanterns, Temple Items, and many more Chinese Antiques, Japanese Antiques, and Tibetan Antiques, from the Ming, Qing, Edo, and Meiji Periods. We have been in the antique business for 25 years, and highly value our customers. Satisfaction Guarantee: All items are carefully described and photographed. The items listed are antiques, and as such may have an expected amount of wear from normal use. We do not sell items with major flaws without mentioning it in the listing. Please note that cause for return does not include barely noticeable minor wear commensurate with age or slight color variations on different computer monitors. Ne chance in a lifetime. 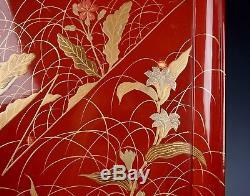 The item "EXQUISITE ANTIQUE JAPANESE RED LACQUER SERVING TRAY 1800s Meiji Gold Maki-e" is in sale since Friday, November 2, 2018. This item is in the category "Antiques\Asian Antiques\Japan\Other Japanese Antiques". The seller is "flowerheartsmile" and is located in Bellevue, Washington. This item can be shipped worldwide.